What is the Biggest Storage you can get from a Smartphone? 1 TB is the biggest storage you can get from a Smartphone nowadays! Internal storage is always the pain point when we are shopping for a smartphone. Ranging from 16GB to 256GB, we always find ourselves stuck in the process of clearing spaces for our phone. Even with the expandable SD card slot which some of the manufacturer provide, we tend to fill them up quickly to. Of course, there’s always cloud storage that can manage and handle the Gazillion data that we all posses. But what if we all want storage directly from the stock phone, and not any third party app or services? The Korean smartphone manufacturer decided to give all their Galaxy Note 9 users 1TB of storage. Picking up the higher end model of 512GB + 512GB micro SD card, you can now have up to 1TB of smartphone storage! This setup or configuration should allow you to keep everything on the phone without needing to install or get a cloud storage service. While we do not encourage to fully utilize the 1TB storage as it would certainly slow down the performance of your smartphone. It might be a wiser choice too if you get a second backup or cloud storage to be the secondary storage for all your data or photos. There’s a number of Free Cloud Storage that you can choose from if you do not wish to spend money on the service. 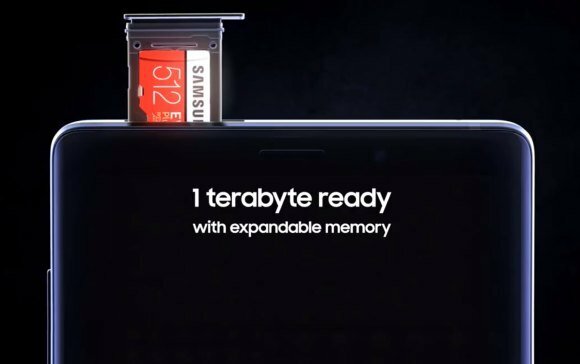 But we certainly welcome the great gesture from Samsung in providing a larger storage space for our daily smartphone and setting the bench mark too. It certainly is a class-leading amount storage for a smartphone with Iphones top out at 256GB only!